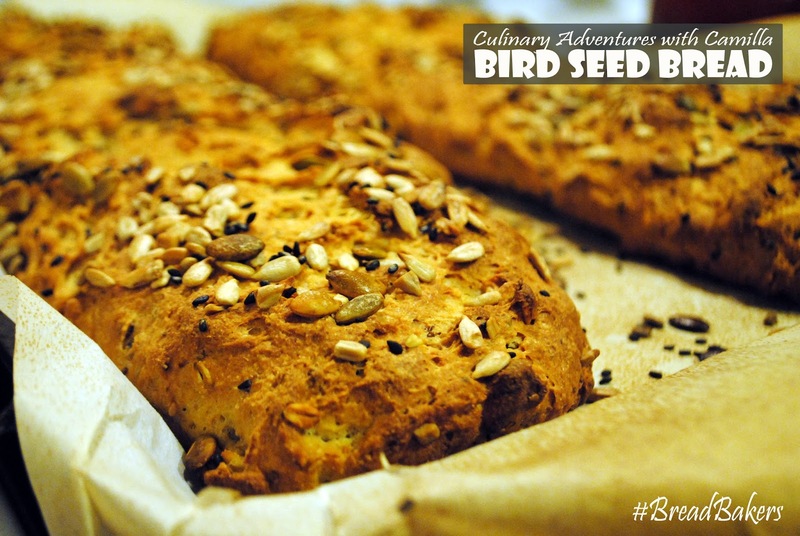 I made these loaves - Bird Seed Bread - for the #BreadBakers' March event. See the bottom of this post for more information about this great bread baking group. Our hostess this month is Karen of Karen's Kitchen Stories. And she picked SEEDS for this month's theme. 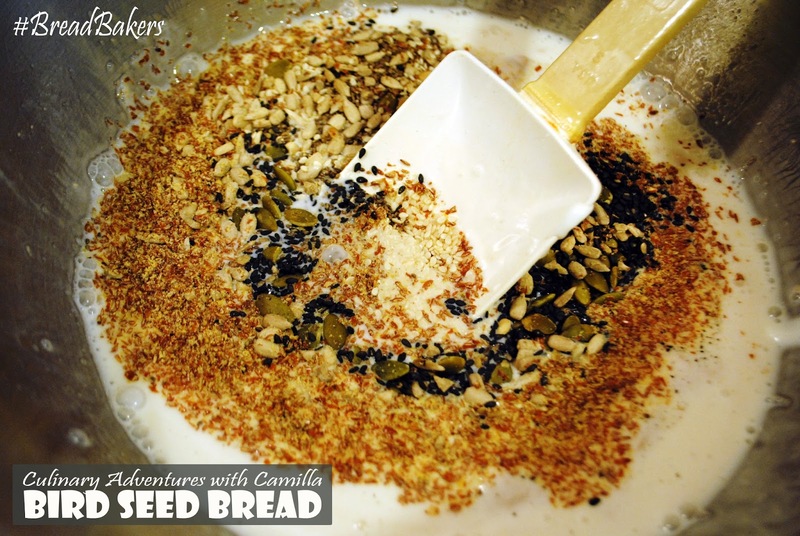 I opted to make a seeded loaf with black sesame seeds, white sesame seeds, sunflower seeds, flax seeds, pumpkin seeds, and chia seeds. Place warm water and sugar in a large mixing bowl. Float active dry yeast on top. Let bloom for 10 minutes. Stir in the remaining ingredients - except the olive oil. Mix with a wooden spoon to make a sticky dough. Knead the dough well and place it in an oiled bowl, covered with a dish towel. Let rise for 3 hours. Punch the dough down and give it one final rise for 30 minutes. While the oven preheats to 425 degrees F, form the dough into a baguette shape. Brush the top with cold water, then sprinkle with seeds for garnish. Bake at 425 for 20 minutes. Then reduce the oven temperature to 400 for another 15 minutes. Remove from the oven and let cool slightly before slicing into it. A great bread for both people and birds! Wow you really went all out with the seeds, what a great mix of things! That WAS the assignment, right?!?! ;) We love seeds. I can't believe I forgot poppy! I am loving the variety in our seeded theme breads. What a beautiful long loaf, Camilla! It is truly an incredible mix of posts, wasn't it? I love the name and all the seeds. I didnt use pumpkin seeds because I thought they may be to big. Perhaps I will try them next time. I think they are a little large, but - maybe - chop them if you think they're too big. Your bread's title reminds me of how much my grandmother enjoyed feeding the birds. She would have had all of these ingredients in her kitchen and would love this bread. Thanks, Holly. I love memories of grandmothers! Thanks for sharing yours. 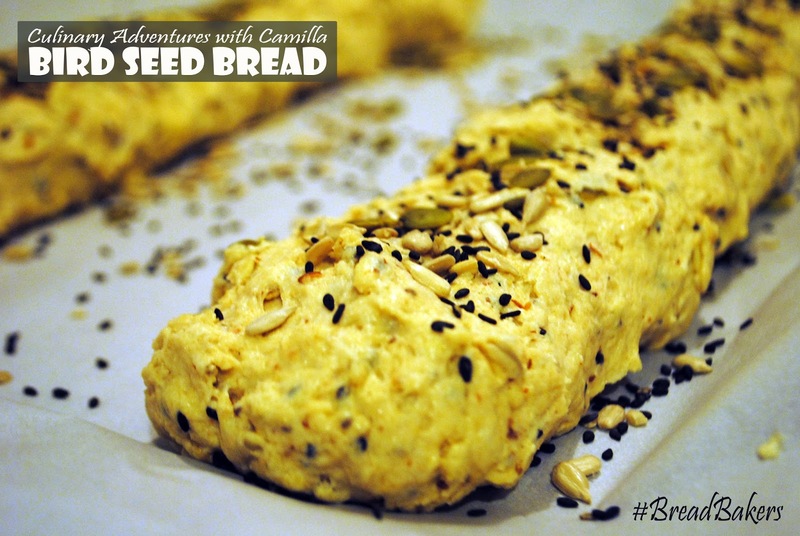 Your bread looks delicious and chock full of seeds! Yum! Thanks, Karen. Yes, it was. It was delicious. Woah, seed explosion! I think you win the award for seedy-est! :) Looks really yummy! Hmmmm...I think for variety, yes. But for volume, I think Sophie's Makowiec wins! Cute name for this bread! Lovely bread filled with the goodness of so many healthy ingredients!! I was really keen to see this bread because of the name. What a beautiful bread with an apt name. Oh wow! You used all the seeds! Lovely bread.